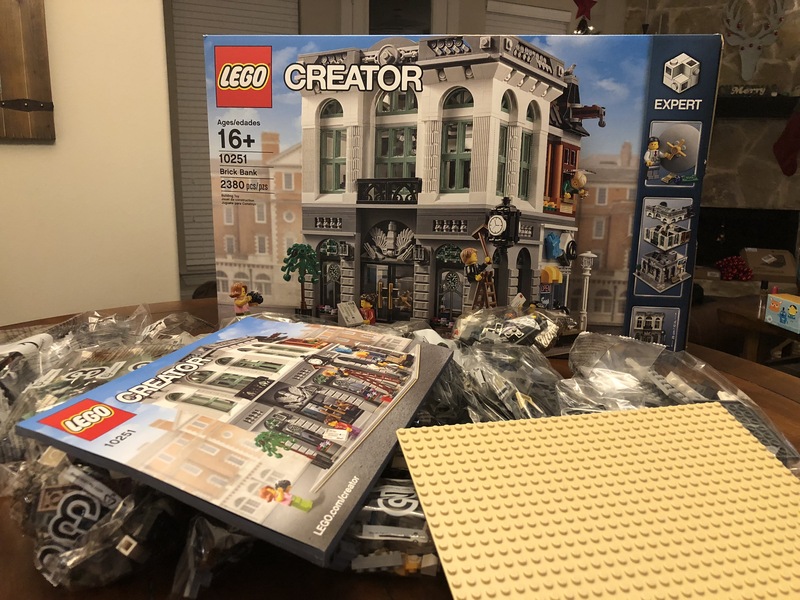 The Creator modular buildings are some of my favorite sets in my collection. 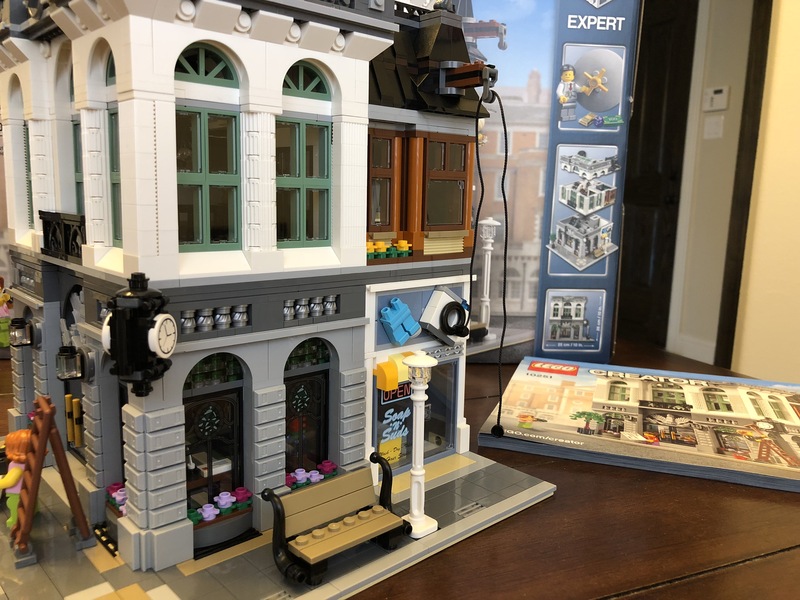 I love that my minifigs have a nice town to live in. It feels like a large town, but it’s not. It is one of those places where classic architecture lives on in the style of buildings. They aren’t just a building for you to conduct business, but they are works of art. As you walk down the street, you see your neighbors, and everyone seems to know everyone else. It’s not all good though. Some shady characters have been hanging out at the pool hall, and the citizens are starting to think that storing their money at home isn’t a good idea. So they petitioned the mayor, and just recently he was on hand to open up the new Brick Bank! The Brick Bank doesn’t seem to get as many accolades as other sets. 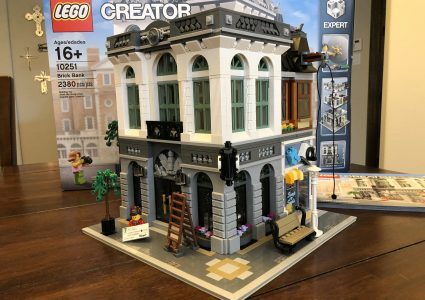 Brickset had a poll on favorite modular buildings, and the results showed that the Parisian Restaurant was the most popular with 27% of the vote, while the Brick Bank only had 6%. 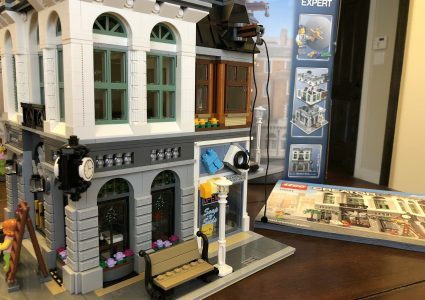 This set does have a smaller size than previous sets, but I think it packs in a large amount of details, and a fun story. 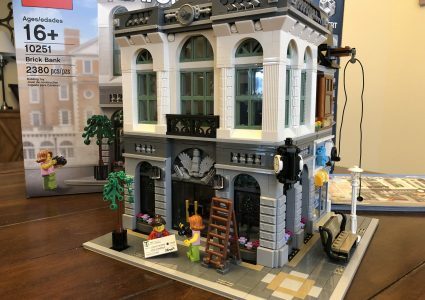 The Brick Bank has fun play elements. The door to the vault can lock, and a crafty burglar can enter the vault through the chimney and via a hidden door. I imagine the guys over at the Pool Hall from the Detective’s Office set bringing their money into the laundry mat to “launder” the money by inserting it into a specific machine, and it leads right to a safe deposit box inside the vault. In addition to that, there is quite possibly one of my favorite elements, a giant check! Who doesn’t love those giant checks! As far as details go, the Brick Bank has a beautiful chandelier that hangs above the lobby. The roofline is very well done, with lots of ornate details. I think the large arched windows on the 2nd floor are very well crafted. Those windows, along with the skylight on the roof, allow plenty of light to flood into the bank. On the 1st floor, you can find some stained glass effects, giving the bank a classic look. The clock hanging on the corner reminds us of a time when businesses and public buildings classically displayed the time for all to see. 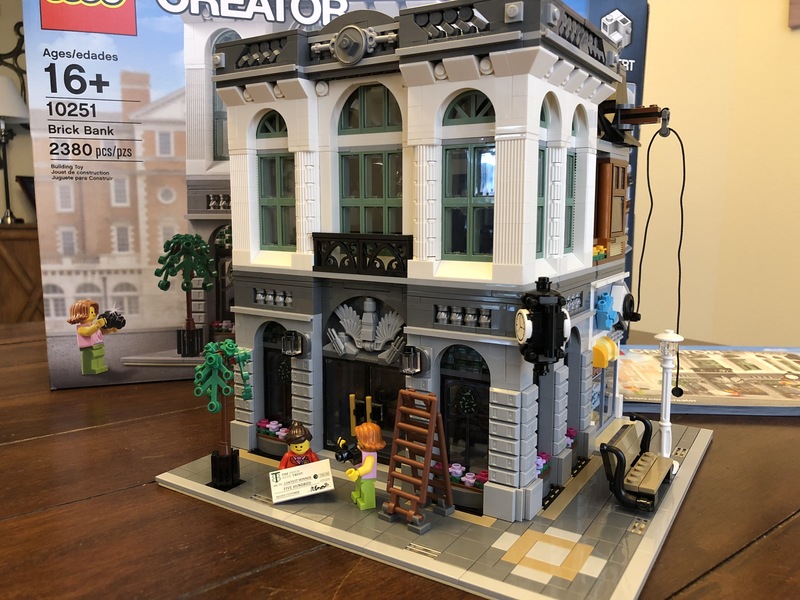 Like many of the modular buildings, the Brick Bank serves more than one purpose for your citizens. While a smaller set, it packs in many details into a small space. 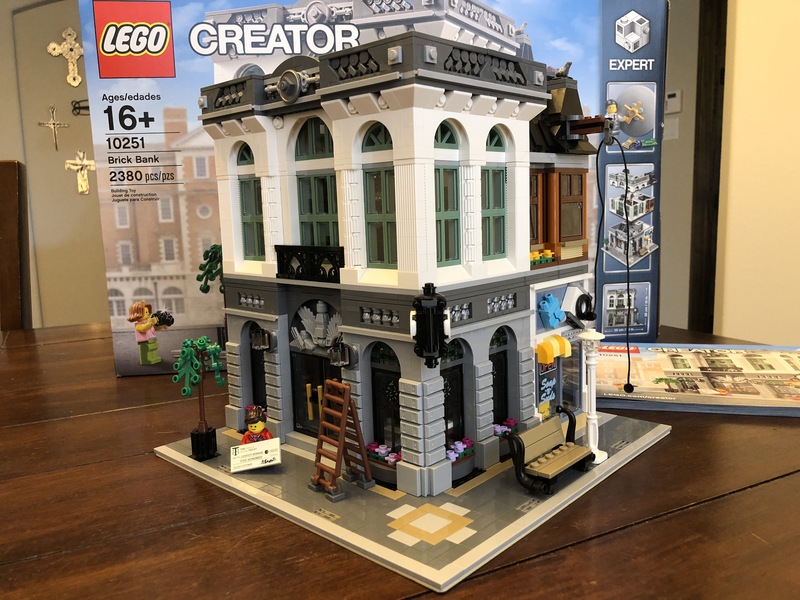 I really enjoyed building this set, and I can’t think of any section that I found tedious to build. Then again, I tend to just enjoy the build process and find even tedious sections fun to build! 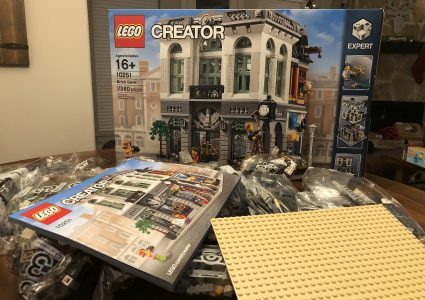 If you’re on the fence about purchasing the Brick Bank, I would say, “Get it!” There is plenty of fun packed in this set.